We had a great day on Saturday at our National Celebration and Annual Conference in Stirling. Over 50 people from across Scotland joined us including lots of people who volunteer in different ways to support people affected by leprosy around the world. Our theme for the day was “Celebrating Partnerships” and different speakers and workshops focused on the different partnerships we have both here and abroad which together allow us to work towards defeating leprosy and transforming lives. Geoff Warne, General Director of The Leprosy Mission International, spoke about 6 different types of partnership which has seen all around the world that demonstrate the close fellowship and common cause of the different parts of The Leprosy Mission. 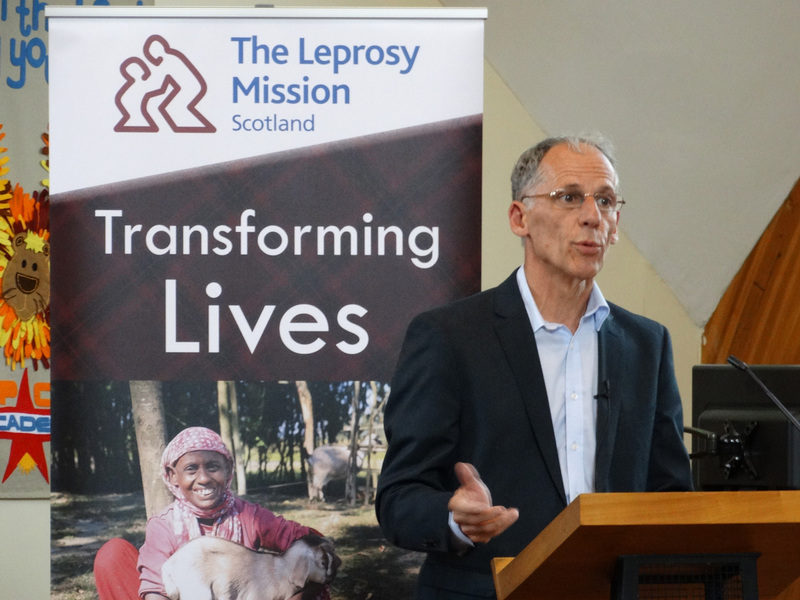 Peter Walker, National Director or The Leprosy Mission England and Wales, told us about the partnership that we with people affected by leprosy themselves and how their involvement in what we do is crucial to our ability to have any kind of long lasting impact. He also highlighted that in many ways this is an uneven partnership and in some ways reflects the uneven partnership that we have with God and which is the source of our inspiration to this work. Linda Todd took time to celebrate the partnerships that we have in Scotland with all our volunteers and how we would be much the poorer, both financially and relationally without those who give their time and talents to help our work. We especially celebrated some of our church reps, some of very long standing, who have stepped down recently. The former, and new, church reps for Stirling North Parish Church, our venue for the day, received a commemorative gift – something we hope to repeat in a number of churches across the country. Alison, Ros, John and Linda shared their experiences of visiting Bangladesh and Nepal in February telling us the sights, sounds and smells from the trip. We heard stories of the wonderful people they met and the strong partnerships that we have with our colleagues there. We were also able to give thanks for the partnership with the Scottish Government that supports amazing community rehabilitation in Dhaka, Bangladesh. Everyone at the conference was also able to choose to find out more about different areas of our work whether by brushing up on the understanding of what leprosy is and what it does, looking more widely at the issues surrounding Neglected Tropical Diseases, of which leprosy is one, or by examining our new strategy to grow and develop our work up to 2020. There were choices too for looking at different ways to get involved through prayer or a number of different ways to fundraise. We enjoyed lunch together, had fellowship over coffee and cake and several times were able to join together singing praises to God, whose mission this is. Even the sun shone. It was a fantastic day and everyone who was there thoroughly enjoyed it and, we hope, left feeling inspired and enthused about the different they have made, are making and will continue to make to defeat leprosy and transform lives. If you weren’t able to make it this year, do plan to join us next year to celebrate all that we have achieved together to support people affected by leprosy around the world.